The D5000 Four Channel Sensor to Computer Modules are a family of complete solutions designed for data acquisition systems based on personal computers and other processor-based equipment with standard serial I/O ports. The modules convert four analog input signals to engineering units and transmit in ASCII format to any host with standard RS-485 or RS-232C ports. 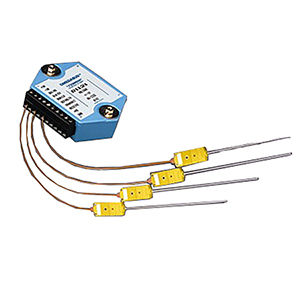 These modules can measure temperature, voltage and current. The modules provide direct connection to a wide variety of sensors and perform all signal conditioning, scaling, linearization and conversion to engineering units. The modules contain no pots or switches to be set. Features such as address, baud rate, parity, echo, etc. are selectable using simple commands over the communications port–without requiring access to the module. The selections are stored in nonvolatile EEPROM which maintains data even after power is removed. The key to the D5000 series is that the modules are easy to use. You do not need engineering experience in complicated data acquisition hardware. With the D5000 series modules, anyone familiar with a personal computer can construct a data acquisition system. This modular approach to data acquisition is very flexible, easy to use and cost effective. The modules can be mixed and matched to fit your application. They can be placed remote from the host and from each other. You can string up to 30 modules on one set of wires by using RS-485 with repeaters. All modules are supplied with screw-terminal plug connectors and captive mounting hardware. The connectors allow system expansion, reconfiguration or repair without disturbing field wiring. D5000 modules are complete four-channel data acquisition systems. Each unit contains analog signal conditioning circuits optimized for a specific input type. The amplified sensor signals are converted to digital data with a microprocessor-controlled integrating A/D converter. Offset and gain errors in the analog circuitry are continuously monitored and corrected using microprocessor techniques. The D5000 converts the digital signal data into engineering units using look-up tables. The resultant data is stored in ASCII format in a memory buffer. The modules continuously convert data at the rate of 8 conversions per second and store the latest result in the buffer. The host computer may request data by sending simple ASCII commands to the module. The D5000 options include a unique programmable single pole digital filter. The filter is used to smooth analog data in noisy environments. Separate time constants may be specified for small and large signal changes. Typically, a large time constant is specified for small signal changes to filter out noise and provide stable output readings. A smaller time constant may be chosen for large signal changes to provide fast response to such changes. The D5000 are designed to be easy to interface to all popular computers and terminals. All communications to and from the module are performed with printable ASCII The D5000 will instantly respond by communicating the ASCII buffer data back to the host. The D5000 offers a variety of userselectable options including choice of address, baud rate, parity, echo, etc. All options are selectable using simple commands over the communications port. All options are stored in a nonvolatile EEPROM which maintains data even after power is removed. COMMUNICATIONS The D5000 are designed to be easy to interface to all popular computers and terminals. All communications to and from the module are performed with printable ASCII characters. This allows the information to be processed with string functions common to most high-level languages such as BASIC. For computers that support standard ports such as RS-232C, no special machine language software drivers are necessary for operation. RS-232C is not designed to be used as a multiparty system; however, the module can be daisychained to allow many modules to be connected to a single communications port. In this network, any characters transmitted by the host are received by each module in the chain and passed on to the next module until the information is echoed back to the host. If a module is correctly addressed and receives a valid command, it transmits a response on the daisy chain network. The response will be rippled through any other modules in the chain until it reaches the host. RS-485 was developed for multidropped systems that can communicate at high data rates over long distances. For systems requiring many modules, high speed or long distances, RS-485 is recommended. Calibration: Autozero, no adjustment pots. Unregulated: +10 V to +30 Vdc, 0.75W max. Protected against power supply reversals. Lead Resistance Effect: <20µV per 350. 참고: Each unit is supplied with a complete operator's manual.